Wow, the family is on speaking terms! Crazy! 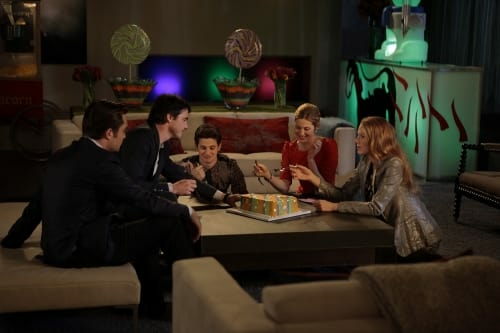 Gossip Girl Season 4 Episode 16: "While You Weren't Sleeping"
Gossip Girl Photo Gallery: "While You Weren't Sleeping"
Serena: Sorry if we kept you up last night. We were playing Scrabble. Ben: She fell asleep to avoid losing. Dan: Since when do you enjoy Scrabble? Mick, Keith and their questionably-costumed cohorts said, "You can't always get what you want." But that doesn't mean it's okay for anyone else to have it either. Gossip Girl Round Table: "While You Weren't Sleeping"